Kody Brown Confirms Robyn's Number One on 'Sister Wives' Tell-All! 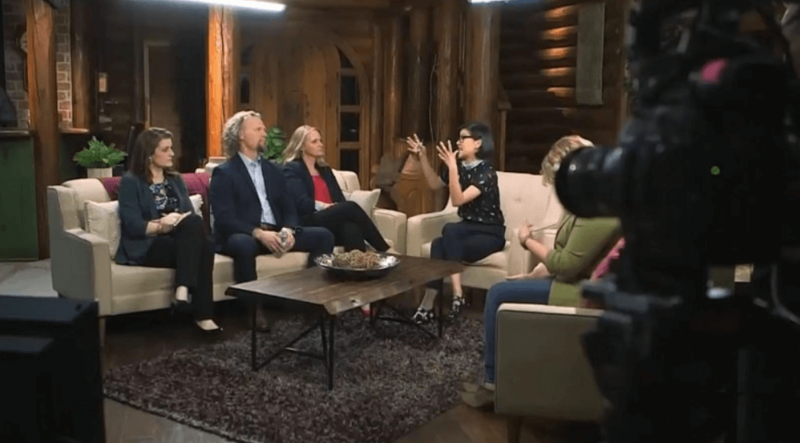 The cast of Sister Wives rehashed the drama surrounding their move to Arizona Sunday night, during Part 1 of TLC’s Tell All special. Kody Brown, Meri, Janelle, Christine and Robyn Brown, along with a few of the Brown kids, laughed, cried and complained, as they swapped commentary about their latest ride on the TLC gravy train. The wardrobe was sensible blazers all around, and Kody was seated between his two best girls, Robyn and Christine. Lots of repeat footage offered a flashback look at the Brown family’s tumultuous journey to Flagstaff, before host, SuChin Pak, put Kody in the hot-seat, challenging him to park his perm forever in Arizona. Kody inadvertently revealed his true mindset, as he tried to justify routinely uprooting his family. Kody Brown and Robyn shared a testy exchange before Kody shamelessly confirmed that he answers to her only — exposing the real inside deal. “When I want to make a commitment to you, I don’t want to promise you something that ends up not working because of circumstances beyond my control,” Kody said to Robyn — his only legal wife. “When I promise — she holds me to it,” Kody said, pointing to Robyn. The other wives sat in nervous silence at Kody’s clumsy admission, until Pak broke the tension, allowing his backup dancers to share their own insights on Kody’s restless ways. In other news — the move was hard. Kody has never packed a more challenging trailer, and Robyn soaked an innocent towel bar with her tears. Janelle confessed the obvious — that she was lazy in Vegas, and loves being lazy in Flagstaff. Kody teared up when he remembered his lost love, his beloved — and likely relieved — son-in-law, Caleb. Robyn solemnly vowed that her bones will be buried in the plagued Arizona soil. Kody and Meri have been rekindling their romance — despite Meri’s harrowing work schedule. Meri was confirmed as Kody’s new re-squeeze — crashing TLC’s clunky preview edit pointing to an outsider invading the harem. Funky Vegas energy has been replaced by cuddly Flagstaff tolerance, and the couple is pumped to occasionally date in a different state. Eight of the Brown offspring joined the Tell All party, to offer teen insight on the season. Hunter was on board to share survivor analysis and to offer Gabriel support, as his brother recounted his personal nightmare. Gabe has adjusted to life in Flagstaff, but clearly carries scars from the abrupt shove out of his successful high school career. Hunter kindly coached his brother through an emotional update, and the kids took turns weighing in on their new normal. Dayton wisely remained silent. On a brighter note, the guys are taller and hotter in Flagstaff. Next week, the Sister Wives Tell-All rewinds a previously rewound storyline.